At Toledo Metal Spinning we offer hydroform drawing services for the production of high quality parts for customers in a range of industries. This method is ideal for forming critical components with demanding surface finish and material thickness uniformity requirements. Known for producing minimal strain, hydroforming is also used when welding is to be avoided. Parts can be created utilizing sheet or tube forms of aluminum 1100-O, 3003-O, and 6061-O, carbon steels 1008-1020, CDA 655 copper, 655 and 718 inconel, and stainless steel series 304, 304 DDQ, 316, 410, and 430. Our state of the art equipment utilizes a punch force of up to 368 t and a pressure of 10 ksi to create custom parts, achieving tolerances of +/-.020 in and +/-.030 in, with +/-.010 in met in special cases. The maximum punch diameter is 12 in, blank diameters can reach 15 in, and flange diameters are also up to 15 in. Hydroform drawn parts are possible in sizes of up to 7 in. in height. We have successfully served customers in the aerospace, agricultural, automotive, building, HVAC, industrial, and manufacturing sectors, producing typical fabricated products such as exhaust parts, furnace parts, engine parts, covers and caps. This process can also produce irregular or complex shapes, as well as squares, rectangles, and round profiles. 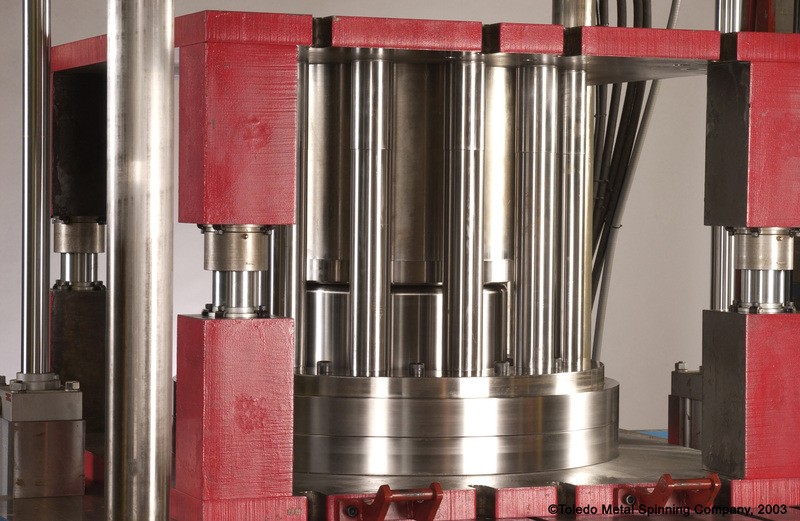 Turnaround times are 2 to 4 weeks for prototypes, and 1 to 2 weeks for production. We cater to prototype, low volume, and high volume production in our specialty production shop, meeting orders from 50 to 50,000 units per year. Our experts work closely with customers to design parts to their specifications and select the optimum manufacturing process, along with offering a number of value added options including welding, secondary forming, metal finishing, engineering support, stamping, embossing, and extruded features among others. Our operations are ISO certified, meeting the highest quality and accuracy levels. For more details about our cost effective hydroform drawing services, or other available capabilities please see the table below or contact us directly. * Greater the part height, the more the maximum flange diameter is reduced. Stainless Steel 410 Low 400 series, generally lower cost stainless steel than 300 series since there is no nickel, is not ideal for extremely deep parts since the lack of nickel reduces stainless steels deep draw ability. The lower amount of alloying elements also reduces the material's resistance to corrosion and ability to weld. Aluminum 6061-O Excellent 6061-O aluminum is easily form in the O-temper due to its low mechanical properties. Once the final shape is obtained, the material can be solution heat-treated and aged. T4 is naturally age, T6 artificially aged. TMS has over 85 years of metal forming experience with a focus on aerospace materials and stainless steels, primarily 300 series stainless steel and 400 series stainless steel. 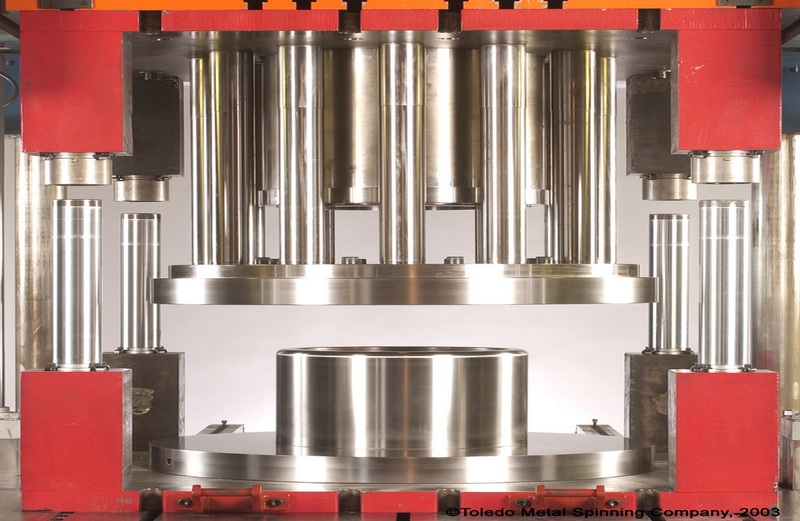 For the last 50 years, TMS has used hydroforming technology for a variety of industries such as aerospace, automotive, military, ordnance, plastics, lighting, pharmaceuticals, dairy and others onshore at home in Toledo, Ohio. TMS engineers on staff with hydroform expertise to help guide you on designing a custom part and choose the optimal process to produce high quality hydroformed deep drawn parts at a competitive and affordable price. The process of hydro-mechanical deep drawing at TMS was originally developed in the 1950’s with a boom in the technology in the 1960’s thanks to the aerospace industry. Often, the final thickness of the part is near 100% of the original blank thickness. This method of forming is ideal for critical components in materials that strain harden or are sensitive to fatigue, surface finish is critical, welding must be avoided, material thickness must be uniform, and or additional forming post deep drawing is required. The process was created to and does produce deep parts without welding and minimal straining of the material. This is accomplished with a blank held in place by a draw ring that is around a punch. 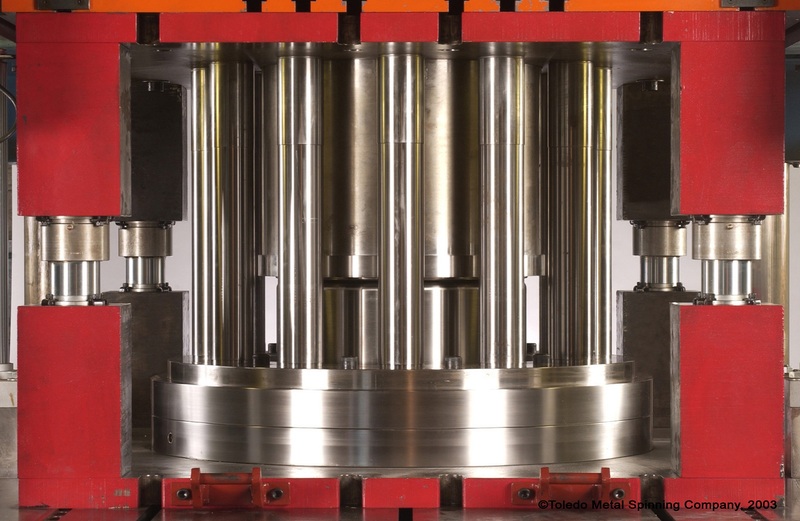 Then the punch pushes the metal blank into a hydraulic chamber that surrounds the work piece and drawing ring. The metal blank then forms around the punch which determines the final part shape.